Given the initial purpose of preserving the landscape and giving sense to an ancient hinterland which is indeed ancient, but also alive in today'slife. We think of an organic development of the villages, so that they can retain their marked individuality, and precisely because of their individuality they may offer a glimpse to the world of a remote yesterday. We think of each village as a hall in a museum that includes the entire territory of the future park. 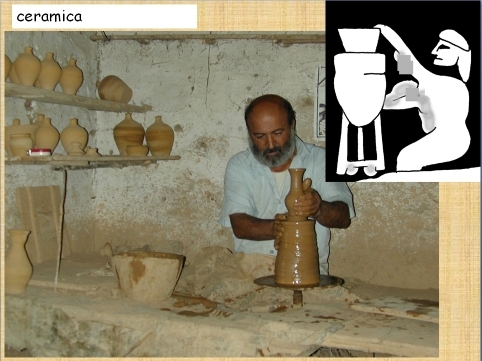 Thus, a village will be dedicated to ceramics: there will be a potter who produces pottery in traditional style, and one or more rooms dedicated to ancient ceramics - not museum objects but representative sherds and, above all, illustrated explanations on the production methods (as in the insert, taken from a seal of the third millennium), styles, chronology, and so on. 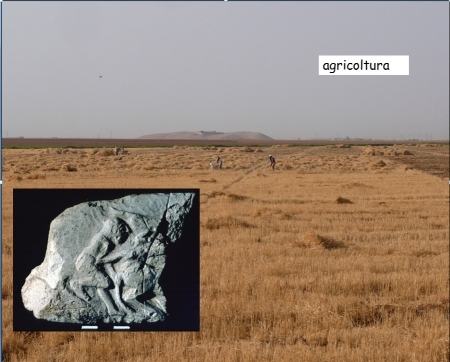 Another village will be dedicated to agriculture.The educational room will explain how the agricultural production took place in at the time of Urkesh, with references to the botanical samples found in the excavations and depictions of agricultural scenes (as in the insert that reproduces a stele dated back to the third millennium). We would also like to propose the establishment of a botanical oasis that would extend on the entire park area. And so on for each village. Similarly, each village will have one or more guest houses, in the style of a "bed and breakfast". The idea is to convey the great Syrian hospitality in the best way, so that visitors may truly feel "guests". Keeping a low profile, it will be possible to guarantee the authenticity that is lost in large hotels (apart from the fact that we would like to avoid the construction of buildings that do not match the landscape).